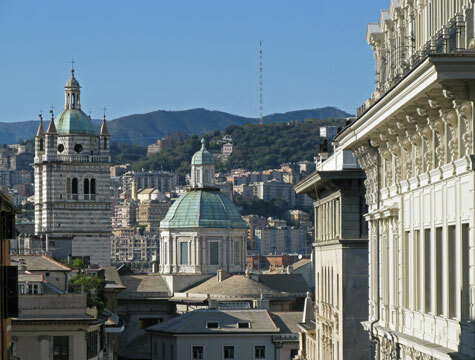 The city of Genoa (Genova) is one of the world's best kept travel destinations secrets. It features many famous landmarks and interesting tourist attractions and enjoys a pleasant, mild climate. Conveniently located near the South of France, Genoa Italy is the gateway city to the Italian Riviera. Most of the city's top tourist attractions are located either near Genoa's main square (Piazza de Ferrari) or by the old Port of Genoa. They include Palazzo Ducale, the Genoa Aquarium and the Grand Bigo. Plenty of excellent hotels and lodgings for tourists can be found throughout Genoa Italy. Genoa Italy has been a travel hub for many centuries. Ferries to Genoa operate from Corsica, Sardinia, Sicily, Barcelona and Tunisia. It is a popular port-of-call for cruise ships and has is home to a large international airport. Frequent train service operates to Milan, Rome and the south of France from Genoa's two main train stations.